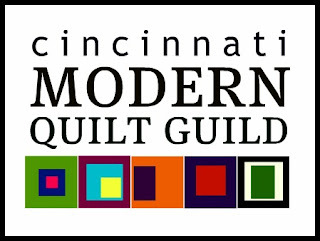 The Cincinnati Modern Quilt Guild held our first Sew-In of the year at The Centennial Barn, our group's new home. I have always wanted to quilt inside of a barn, and today I got the chance. And although it might sound a bit corny, it really felt like home. Our group worked in a second-floor loft area, which was set up with plenty of table space and room to spread out. The Barn was built in 1898 and was renovated in 2010. It's located on a 35-acre parcel of land that is part of the St. Clare Convent which is run by the Franciscan Sisters of the Poor, who could not be more kind, generous, and accommodating to our group. Here are a few shots of the exterior of the Barn, which is constructed from brick and has an adorable green metal roof. It was way too cloudy today to get many good photos! I bet this view will be beautiful in the spring and summer. The renovation of the Barn was done extremely well, and I especially love that so many of the it's original features have been kept intact. There are tons of exposed beams and rafters throughout the interior. There are tons of exposed brick walls inside too. Don't you just love the pattern of this arched section? And the cutest barn doors you've ever seen. Our monthly meetings will be held in this large room on the first floor. There are more original beams and moldings in our room. And the cutest little windows. There is even an attached kitchenette that we can use during our meetings. The CMQG meets monthly, on the second Wednesday of the month, from 7-9 pm. Our next meeting will be on March 9th, and if you're in the area, we'd love to have you join us! 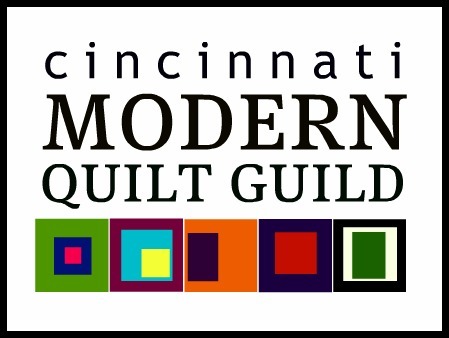 Feel free to email us at cincinnatimodernquiltguild@gmail.com for more information, or check out our Facebook page. The Textile Art Alliance of the Cleveland Museum of Art has a call for entries for their Focus: Fiber 2011-2012 exhibition. It is a regional, juried exhibition that will feature the best of contemporary textile/fiber work from an eight state region, including residents from Illinois, Indiana, Kentucky, Michigan, New York, Ohio, Pennsylvania, and West Virginia. The exhibit will be juried by internationally recognized fiber artist Dorothy Caldwell and will be on display at the Canton Museum of Art in Canton, Ohio. The TAA will produce a color catalog to accompany the exhibition. Entries are due April 30, 2011. For more information and to download the prospectus please visit the TAA's website. The big news is that our Sew-In will be held at a new location for the CMQG: the Centennial Barn (http://www.centennialbarn.org/). We are really excited about this new space and we think it will solve a lot of the issues we had with prior meeting space. First, the Barn has various sized meeting rooms, so there is room for our group to grow. At the same time, the rooms at the Barn are not so big that we will feel overwhelmed by the space. We think the space will be appropriately cozy! And, we can configure the room however we need (e.g. tables for the sew-in; chairs for the meetings). Second, there is plenty of parking behind the Barn, so no more worrying about leaving your car on the street. Third, the Barn hosts a wide variety of community oriented programs, including arts related events, so we think the Barn is a good fit for the CMQG. Tables, chairs, a large cutting mat, an ironing board and an iron. A couple of folks have signed up to bring drinks and some light snacks as well. You’ll need your sewing machine and related supplies, of course. You should also bring an extension cord, your own cutting tools, and your own lunch. The natural and overhead light is very good in the room, but if you need task lighting you may want to bring your own. If you haven't heard by now, Cincinnati is about to become the new home of a modern sewing lounge in the Design District of Oakley. Sewn Studio is set to open on February 14, with a huge grand opening celebration to follow on the 26th, but last week I was lucky enough to meet Stephanie, the owner, at the shop for a bit of a sneak peek. Let me tell you, I was like a kid in a candy store. There's nothing like it in the city, and I for one cannot wait for the doors to open. Until they do, here are some photos to whet your fabric-loving appetite. There are shelves full of bolts of beautiful fabrics lining the walls of the shop. Gorgeous Soul Blossom fabrics, Amy Butler's newest line. A reading lounge, fully stocked with loads of inspirational books on sewing and quilting. Bright, cheerful fabrics from Riley Blake. A beautiful selection of Central Park by Kate Spain. And almost every color imaginable of Mettler thread. Stephanie is going to offer classes ranging from Sewing 101 to more complex courses down the road. She's also looking into holding workshops with some of the top fabric designers in the industry. Sewn Studios is located at 3212 Madison Road, Cincinnati, Ohio 45209. The shop will be open Mon.-Wed. 10-6, Thurs. 10-8, Fri. 10-6, and Sat. 10-5. There is ample off-street parking located directly behind the shop. as well as some on-street parking right in front of the store. For more information and updates, please become a fan of their Facebook page by clicking here and check out their website as well.